FDR said, in his second inaugural address, “We have always known that heedless self interest was bad morals, we now know that it is bad economics.” He was referring to the abuses that led to the 1929 stock market crash and the Great Depression. Even now, nearly eight decades later, we find that corporate greed has led to unconscionable decisions which, in turn, have resulted in peril for one of America’s industrial giants and for millions of American citizens. 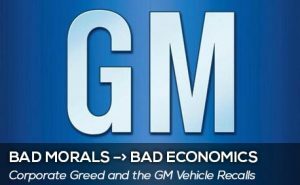 I’m referring to the choice by GM not to spend one dollar per car to correct the problems with the ignition switch that has cost at least 12 people their lives and caused 31 accidents. GM itself faces a criminal investigation and multiple lawsuits alleging they knew about the faulty ignition switches in 2002 but waited until 2014 to recall a total of 2.5 million vehicles that have ignition switches that may easily be moved out of the “run” position and into the “auxiliary” position, causing loss of power, steering, braking, airbags and lighting. That’s bad economics any way you look at it.